Scotch highland whisky brand The Dalmore releases exceptionally rare champagne-finished 50-year old single malt to commemorate master distiller Richard Paterson’s 50th in the whisky industry. Most people celebrate their 50th anniversary at the job by actually retiring from it, but retirement is obviously not on Richard Paterson’s mind. The Dalmore’s master distiller instead works with four other legendary luxury houses and releases yet another definitive luxury bottle in The Dalmore 50 to mark this milestone in his career. 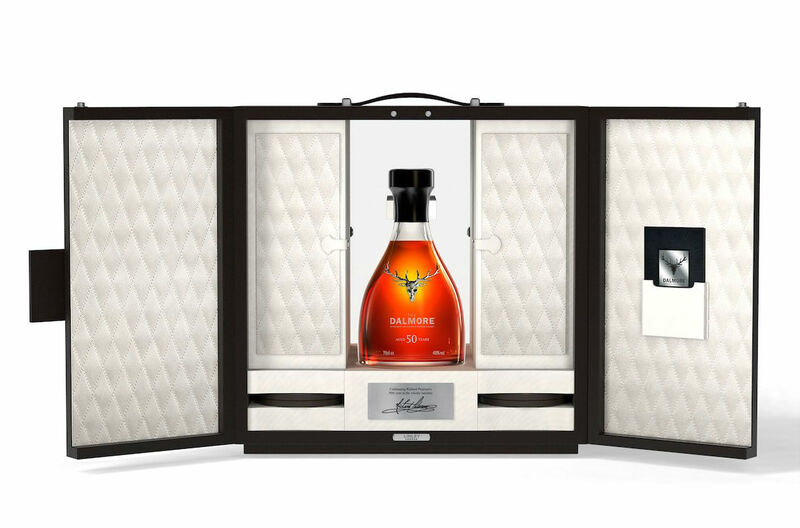 The Dalmore 50 has been crafted in partnership with accomplished British furniture marker LINLEY for the special box that houses the crystal decanter created by French crystal house Baccarat; the decanter itself is adorned with a solid silver stag – the mark of The Dalmore – fashioned by famed British silversmiths Hamilton & Inches. But for those among us which prize the spirit above all else, The Dalmore 50 exceeds even Paterson’s most accomplished achievements. The original spirit has been matured in American ex-bourbon white oak casks, before being transfereed to Matusalem oloroso sherry casks from the world-renowned Gonzalez Byass Bodega and Colheita port pipes from Portugal’s Douro region, and then further cask matured – a Paterson and The Dalmore hallmark – for 50 days in rare champagne casks from Domaine Henri Giraud. Wine enthusiasts may be familiar with Domaine Henri Giraud, which produces champagne from grapes grown on the family’s property in Champagne’s rarest and most highly regarded grand cru village of Aÿ. 12th generation winemaker Claude Giraud of the Giraud-Hémart family combines traditional champagne making with technology, using GPS to track and source terroir in Champagne’s Argonne Forest in which to make barrels to put his top wines in. Paterson picked the champagne cask from Domaine Henri Giraud for the simple reason that the French wine maker was one of the few remaining champagne houses that still mature their wines in casks. Only 50 decanters of The Dalmore 50 is available worldwide, and price is upon asking. For inquiries in Singapore, call The Dalmore concierge hotline at +65 9108 5545. This coming Negroni Week in Singapore? It’s yuge.